A tale that follows three children from their upbringing at English Boarding school into their adult lives and the outlined roles they must live out. "Never Let Me Go" is a breathtaking portrayal of humanity masked in a controversial topic that left me enamored and stupefied. On the surface the story is a richly stimulating science fiction tale. One that is not cluttered with details, setup or a bunch of flash. Only basic necessary facts are given to set the table. With the setting out of the way, the story shifts into a captivating perspective on the psyche of our destined human lives. One huge elephant in the room with "Never Let Me Go" is that it has been marketed as a reveal movie. Generally with reveal movies I want to know as little as possible and this film benefits from that mindset. Thankfully director Mark Romanek and screenwriter Alex Garland waste little time dragging out the reveal. It comes early on in the first act and extremely effectively. As the story dictates, the children must be made aware of their roles in life, so to are the viewers. In retrospect, the reveal is of little matter because the film does not focus on the setting or the reasoning behind the institutions that are in place, but instead it peers into the souls of those who are participating within the system outlined. Director Mark Romanek and cinematographer Adam Kimmel do an absolutely stirring job of creating a somber and sterile environment that is absolutely beautiful. Their shared ability to make the plain seem natural and also to find the beauty in those simple things is fabulously portrayed throughout the 103 minute drama. The plays on the muted colors throughout the film are immaculate. From the fade-in's to the costuming on to the settings, everything is subdued but jarringly vibrant. "Never Let Me Go" has very few locations and is designed to feel sheltered, yet eerily it comes across as voluminous. In other words, the world that we are given privy to is very microscopic yet still it ends up feeling grandiose and as involved as each of our own lives. Kazuo Ishiguro's original novel of the same name is very much a story about love and human emotion cloaked in a controversial topic and screenwriter Alex Garland does a unmarred job of translating to the screen. His script is a no nonsense approach to the human existence. The relationships we form, the emotions we go through and the terms we all must face. The weight of the story can be jolting, but only because we can relate to it so easily. There is real heart, charm and laughter along with heartfelt sadness, spite and darkness within "Never Let Me Go," emotions that mugged me. Stuff that resonates within us all and stays with you after the fact. It is worth mentioning that Rachel Portman's score melds perfectly with the riveting science fiction tale. The music throughout is classic. It sweeps you into the children's world, while also taking you through their heartache. There is a gorgeous repetitive quality to the score that immediately grabs your attention and continues to do so as certain prevailing themes and tones come back throughout the film. Portman does a flawless job of bringing every emotion to life through music that the director, actors and screenwriter had prescribed. It is a score that when re-listened to will immediately return the viewer to the film. "Never Let Me Go" has some of the most enduring performances I have seen all year. The entire cast is unblemished. The film is viewed through the eyes of Kathy played Carey Mulligan and she does an award worthy job of carrying the scifi on her shoulders. Mulligan had previously shown her talent level in last year's "An Education" and here she simply backs up that fabulous performance with another jaw dropper. Seriously, I will be shocked if Carey Mulligan is not at the very least nominated for Best Actress, let alone hands down winning the category. She is immaculate. Andrew Garfield continues to impress me with his acting abilities and here he does nothing short of a terrific job portraying Tommy. Keira Knightley too delivers a engaging performance. Her character is extremely important to the relationships throughout the story and Knightley does a unsurpassed job evoking all the right emotions. Knightley is so good, she could very easily warrant herself a nod for Best Supporting Actress. Casting director Kate Dowd deserves a ton of credit for landing such a talented group of young actors to play Kathy, Tommy and Ruth growing up. Isobelle Meikle-Small, Charlie Rowe and Ella Purnell come across as veteran thespians. The kids have nearly the entire first act of the movie to draw you in and not just any child actors would have been able to pull off what "Never Let Me Go" has them comprehending at such impressionable ages. Charlotte Rampling and Sally Hawkins also must be mentioned for their albeit brief but staggering portrayals. Rampling plays the head mistress at the English Boarding school the children attend and Hawkins plays a newly hired teacher. Both of their performances and character development are pivotal to the film and they pull it off in tremendous fashion. "Never Let Me Go" is the best kind of movie because it has double meaning and it stays with you. There is so much elegance and complexity to the film, yet it is ultimately muted and basic. Being both complex and simplistic in nature. The film keeps you thinking about the story, its concept and the characters. The film will also leave you thinking about bigger questions and the overall picture. It is a science fiction story and at the same time a true perception into our own ethics, morality and humanity. 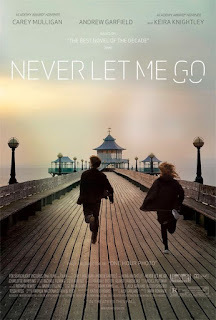 "Never Let Me Go" is a scifi movie and it is a romance. You go through the full range of emotions with the three main characters and you find similar harmony within yourself. It is touching and beyond immersing. It is a masterpiece. Wow. I saw this at an early screening quite a while back and could not have liked it less. Either they re-cut the film, or you and Jonnie C stand on the other side of a HUGE divide about this movie. I suppose that I don't buy into the notion of souls to begin with is one reason I was turned off by the film, but I just overall found it dull and not emotionally-involving, despite some pretty strong performances. The movie wanted to be sci-fi and a love story but didn't succeed (for me) at either.